LONDON, England (CNN) -- The first venue to be completed for the 2012 Summer Olympics hosts its first major international sailing competition this week, in what is considered a test run for the Games. Olympic hopefuls are currently training at the Weymouth and Portland National Sailing Academy, site of the 2012 Summer Games. The Skandia Sail for the Gold Regatta brings together 750 sailors from 38 countries, on more than 450 boats, making it nearly twice the size of the 2012 Olympic sailing event which will host 380 sailors on 250 boats. Olympic hopefuls and veteran medallists alike are using the regatta to gain experience on the 2012 course. "It's an opportunity to learn about the Olympic course," world number one Laser sailor Paul Goodison told CNN. "The only reason I'm sailing this week is to try and learn about the waters themselves," said the Olympic gold medallist who currently has an injured shoulder. "There's no way I would be sailing if this wasn't practice for the Olympics." "This is a very exciting event. It's a very good way of testing the facilities and the organization on the water and of giving the top sailors the opportunity to come and compete on these waters," John Tweed, Chief Executive of the Weymouth and Portland National Sailing Academy (WPNSA), the competition venue told CNN. Weymouth and Portland boast some of the world's best small boat sailing waters. "We have a very large enclosed harbor with good clean winds and relatively flat water, which is ideal for sailing," said Tweed. "We also have access to Weymouth Bay beyond where there are bigger waves. "Besides some strong winds, we've had very good racing this week." Goodison confirmed that sentiment: "It is quite a long way out, but when you finally get out there it is great sailing," he said Thursday after winning a race. Goodison is hoping to take home yet another World Cup Championship when awards are handed out in Weymouth Saturday. This week's regatta will be his last before he takes a self-imposed break from sailing "at least till Christmas." "Last year I took three or four months to reflect and it seemed to work brilliantly. I've won every event this year," he explained. "If you must keep doing the same thing, day-in day-out, its quite hard to keep your motivation at 100 percent and to keep your focus that high, which is needed. You can get a little tired of doing what you're doing. It can lose the thrill." In my time off I'm going to pursue my other hobbies, like kite surfing and windsurfing ... keep my life much more balanced so when I come back I'm highly motivated and ready to win," he said looking forward to the 2012 Olympics. For the WPSNA, the success of this week's event caps a $24.5 million (£15 million) renovation started three years ago for the London Games. 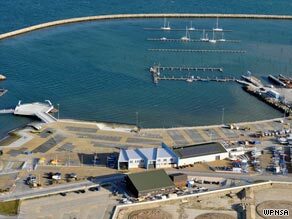 The former naval base is now fully operational and welcoming foreign sailors to train in its waters. Both the Beijing and Sydney Olympic host committees were accused of preventing athletes from training in competition waters, but the academy says they are determined to provide open access to international teams. The new facility sits on the historic Dorset coast, England's only UNESCO Natural World Heritage site. "It is the only place where the whole coast of the marine Jurassic occurs. You have the newest rocks in east, and as you walk westward you go back in time," said Tweed.